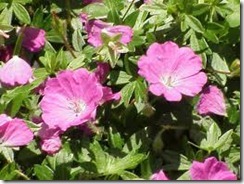 Geraniums are known as a long-lasting flower. 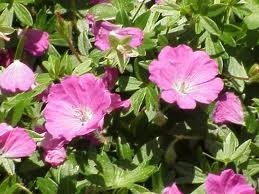 Diseases can, however, shorten the life span of a geranium plant. Ensuring the proper cultural practices is paramount to avoiding brown spots on geranium leaves. Brown spots on the leaves of geraniums are often the result of bacterial blight, often referred to as bacterial spot. The disease is caused by a bacteria, Xanthomonas campestris pv. Pelargonii. Bacterial blight begins as brown spots on the undersides of leaves but eventually spreads to the entire plant. Some leaves develop dark veins, and the entire plant becomes flaccid. Stems turn black and may shrivel into a black rot. Removing weeds and debris from around the plant helps avoid bacterial blight. As the disease thrives on wet foliage, geraniums should be watered in the morning so that leaves can dry throughout the day — watering directly into the soil is advisable. Spacing plants far enough for air circulation also thwarts the disease, and all infected leaves should be removed as soon as possible.